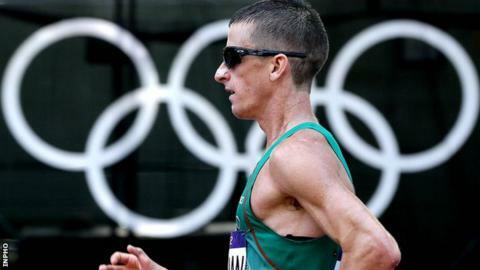 Irish walker Rob Heffernan is expected to be upgraded to Olympic bronze after The Court of Arbitration for Sport (Cas) upheld IAAF appeals against Russian athletes relating to doping. Heffernan finished fourth in the 50km walk at the London Games in 2012, a race won by Russia's Sergey Kirdyapkin. The ruling should also see fellow Ireland walker Olive Loughnane upgraded to World Championship gold. Loughnane was pipped to 20km gold by Russian Olga Kaniskina in Berlin in 2009. Kaniskina's results, covering the period 15 August, 2009, to 15 October, 2012, have also been disqualified. "I'm delighted to hear about this long-awaited ruling and, most importantly, that Robert and Olive will now get the medals that they deserve," said Professor Ciarán Ó Catháin, President of Athletics Ireland. "This now completes the set of European, World and Olympic medals for Robert to put him up there with one of Ireland's most successful athletes. "Hopefully Robert can go to Rio and win a medal to get the proper experience and feeling he deserves standing on the podium." Australian Jared Tallent will be awarded the gold medal after coming second to Kirdyapkin in London.